I've completed a post on my blog that deals with retract settings - especially for PLA and ABS. I'll post the figure and the recommendations here. If you want to read the full details, see Some musings on retracts. Temperature is a key player since the hotter the molten filament, the more fluid it becomes. If the fluid becomes too fluid, it could simply drip out the orifice rather than be pulled back up with the retract. This is why printing at too high temperature than required is not a good idea. 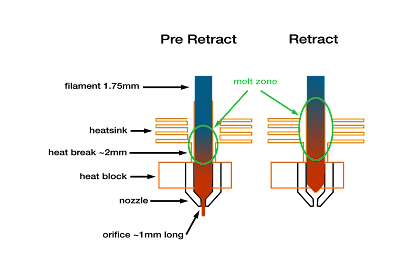 Ideally, you want to find the minimum reliable melt temperature to maximize the viscosity of the molten filament. The length of the orifice also plays a big part. In fact, my experimentations and modifications a few years ago with the E3D V5 hot end nozzle geometry resulted in a redesign that is now the V6 hot end. If the nozzle bore is too long, materials like PLA tend to not be cleanly retracted and can ooze. Many people then compensate for this oozing my increasing the retract length - which see next. Retract length has a very large impact. The longer the retract, the further up into the heartbreak the melt transition zone is pulled. It also tends to elongate as shown in the diagram. When the retract gets to a certain point, the top part of the melt transition will actually cool and solidify in the cold zone (heatsink). This results in a plug or jamming. Depending on many factors, sometimes this plug will be pushed ahead and remelted when the filament is advanced. However, if these factors are aligned against you, a jam occurs and results in filament starving and your print will show gaps. Many times this starvation might self-correct if another retract happens soon afterwards and frees things up. But if you are really unlucky, the plug continues to solidify and your print is completely ruined. Retract AND advance speed also play a big role. If retract is too fast, the molten plastic just "snaps off" at the end of the small diameter orifice and the nozzle bore is not cleared. If too slow, you waste a lot of time. On the other side, advance, a different situation exists. If you advance too quickly with PLA, the molten material appears to increase in viscosity to the point where it will not flow. This is called non-Newtonian fluid behavior. Most of the time, this might not cause a problem but in some cases, it can result in a plug and filament starving. With PLA, you can actually retract rather quickly (50mm/s) and advance slower (20mm/s) with excellent results. At this writing, only the KISSlicer provides this capability (and it was added at my request). It makes a difference. I've print 100s of parts a month in PLA and have not had a single jamming/plugging issue in several years. First and foremost, determine the minimal melt temperature for your filament. See my Strategies for Successful (and Great) Prints point #9 on how to do this. Don't over retract. The E3D V6, SeeMeCNC HE280 and other similar all-metal hotends should perform very well with 1mm retract. PLA is more sensitive to retract/advance speeds than ABS and other materials. My recommendation for PLA is to retract relatively fast (40-50m/s) (and short as per the previous guideline) and advance slower (20-25mm/s). At this time, only KISSlicer has this feature. In other slicers, a reasonable compromise is to retract and advance at 20-25mm/s. Keep your nozzle tip clean and polished. One thing worth mentioning is the difference between various plastics, PLA aha s thixotropc state between solid and molten which is why it jams and ABS doesn't tend to. PLA also gets less and less viscous as temperature rises, almost to the point it's like water. ABS On the other hand doesn't really change viscosity with temperature once it mets, eventually just burns. Absolutely Polygonhell. PLA is the worse of the lot, which is one reason folks struggle with it. ABS is a pleasure to print but even so a bit of care in tuning will produce better parts. Thanks for this info, a very nice tutorial. Thanks for the great explanation. I have been messing with retract speed and settings in matter control for a week or so. Been happily printing on a Rostock MAXv3 however I still have a minimal amount of stringing even with 6 mm retract settings. I have followed your settings pages pretty thoroughly so I would suspect a lot of them are the same aside from my larger retract distance. I read a lot that 1 - 5 mm is typical retract distance, but considering that I am upto 6 mm with some remianing strings I am wondering if there are some other settings worth investigating. I also have referenced the say no to stringing and oozing article on matter hackers. Printing PLA, 195C, 55C bed temps. Retract 6 mm. Retract/advance speed of 30 mm/s. Z lift of 5 mm. 1. The 1mm retraction you quote is measured at the hot end. With a long Bowden tube, the retraction at the extruder drive may need to be a lot greater. I need to use at least 7mm to avoid blobs. This is with a genuine E3Dv6 hot end ad 650mm Bowden tube. 2. Although most slicers don't support differ retract and un-retract speeds, some support firmware retraction, and some firmwares support different firmware retract/un-retract speeds. 3. For those who only print PLA, a hot end with a PTFE liner may be a better option than an all-metal hot end. One of my printers has a PTFE-lined hot end and it has never jammed, apart from when I was testing stupidly large amounts of pressure advance. tehwadeski wrote: but considering that I am upto 6 mm with some remianing strings I am wondering if there are some other settings worth investigating. Try bumping up your travel speed / acceleration. This breaks the filament strand instead of slowly drawing it out into a string. This solution has worked really well for me. I'm at about 100 mm/s travel speed, when printing at around 50. 1. David, I do use 1.8mm ID PFTE tubing on most of my deltas so there is very little slop. But I have a couple with the standard 2.0mm Bowdens. I can't believe that 7mm at the extruder drive translates to 1mm at the hot end, I've never observed that much difference on those with 2.0mm ID tubing of about the same length as yours. But its an easy thing to check - simply pull the tubing out of the hotend and do some feed - retract cycles. I like to push my thumb on the end of the filament coming out of the tube to simulate the back pressure. I just did this on my Rostock with 2.0mm tubing and 1mm retracts are pretty darned close to 1mm at the business end. I'd make sure to verify anything greater than 5mm is less than that at the hotend or you can certainly plug a V6 hotend by extracting molten plastic up past the heat break. 2. I understand that Cura now supports this. So KISS and Cura are the only 2 slicers I know of. 3. I've printed several 100 KGs of PLA on multiple printers with V6 hotends and it has been several years since I've had a jam (touch wood!). I haven't done the research yet but I suspect that the PTFE lined hotends like the HE280 and V6 lite might severely limit filament flow rate (which affects print speed) due to lack of "pre warming" the filament. I can't get anywhere near the print speeds with the HE280 hot end as I can with the V6. I have a V6 lite here to test and when the Jet becomes available for the HE280, it increases the "warm zone" by replacing the PTFE liner with SS. Should be an interesting test. Great write up, thanks for posting. Do find that z-lift plays a role in retraction considerations? What z-lift setting do you prefer for your rostock max with E3D? Thanks! Retract and Z lift work together. On machines like deltas that have fast Z movement, a fast Z lift along with retract helps "snap" the melted filament rather than draw a thin string for materials like PLA. I use a 4mm Z lift for all of my deltas. The longer the Z lift, the more time spent moving up and down - slowing down overall print speed. 4mm is a good compromise between minimizing stringing and not wasting time. I would first say thank you for your wonderful blog and all his important advice I run recently with a Prometheus V2, can we say I have to use a short retraction distance like an E3D or other all metal hotend ? I know nothing about that hot end. Maybe someone with one can chime in. I suspect that "it depends" on how you have it setup since I understand there is a lot of flexibility in heated zone length, etc. If someone wants to send me one, I'm happy to test it. I setup like Bryan @bvandiepenbos, he have one. I'm really happy but with 1mm I have lot of stringing (Used E3D Edge) and with 6mm I clogged my hotend and with 4-5mm I have some hole on the perimeter. I would say then, yes, keep it to around 2mm retract. The Prometheus has an uninterrupted barrel within limits and can tolerate a lot of retraction without jamming if you have a strong enough extruder to push it through. I use 3.5 - 4.0mm of retraction for PETG and typically 1.5 - 2.0mm for PLA. I'm currently using a Bondtech Extruder. A stock EzStruder may be more limited on extrusion force before it begins to strip filament. ccavanaugh wrote: The Prometheus has an uninterrupted barrel within limits and can tolerate a lot of retraction without jamming if you have a strong enough extruder to push it through. Ok so, maybe i'm still to high at 4-5mm, I want try between 3-4mm like you for PETG. Yes i have a stock EzStruder, he don't miss step with 5mm but I have some hole on the perimeter or when he start after rétractation.